WordPress Plugin Staff Search – Overview. For advanced search options that allow users quickly and easily search for matching records you can purchase and install our Staff Search plugin extension. What is a Plugin Extension? WordPress plugin that adds a new functionality to the existing plugin. It won’t work in the standalone mode. The Staff List Pro needs to be installed and activated. Multi Filters add advanced search options to existing list or grid pages. 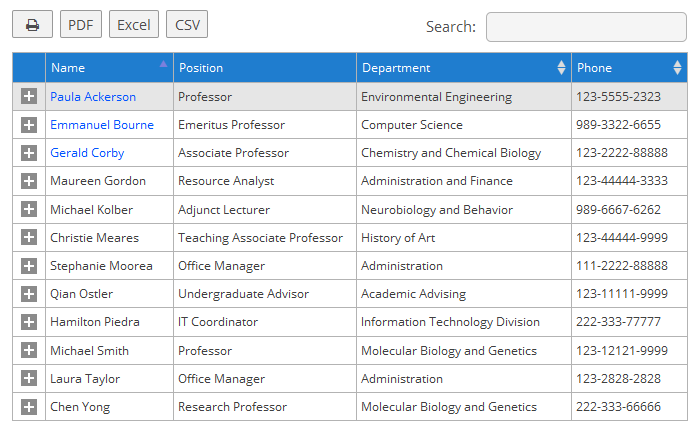 Search Table creates a new table view of your data with powerful and flexible sort and search capabilities. Staff Search extension is not compatible with the free version of Staff List. Categories, AZ and Single Field Text Search filters. You can add up to to six filters per page.